It’s one thing for your keys to go missing, or to misplace your favorite shirt. But when you have missing teeth, it’s critical to replace them as soon as possible. Moreover, it’s important to understand which dental prosthetic will work best for you. In most severe cases, your New Image Dentistry dentists will recommend an all on 4 dentures in Olmos Park for the best tooth replacement option by combining dentures and dental implants. Past tooth replacement options only addressed parts of the teeth that were above the gum line. Thankfully, now we’re able to replace both what lies above and below the gum line. Both parts are equally important. Dental implants are small, titanium posts that mimic the root of your tooth (below the gum line), restoring the health of your jawbone. A tooth replicate (prosthetic of your choice) will then be attached to restore the portion of your tooth that lies above the gum line. So, what are all on 4 dentures? You can achieve fully-functioning, new teeth in a short amount of time. Your appearance will improve—and the way you feel about yourself. You can eat the foods you love without reservation. You eliminate those health issues that are associated with tooth loss. You can care for your teeth as if they’re your natural teeth. You will enhance your quality of life. Are you ready to explore the various options dental implants have to offer? Missing teeth—especially a lot of them—can make life more difficult. Luckily, you can replace them permanently with dental implants. 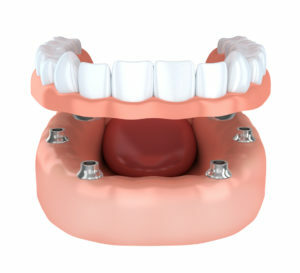 We have the resources available to do so in the least invasive way with all on 4 dental implants. Do you still have more questions? Feel free to contact our office and schedule a consultation to meet with someone on your new dental team from New Image Dentistry. When it comes to choosing a dentist to trust your oral health with, it’s reassuring to know that there is a San Antonio practice that has been family owned and operated since the very beginning. We strive to offer high-quality care for each of our patients—especially when a patient needs assistance with severe tooth loss. Using convenient and effective all on 4 dentures, we can help you achieve a fast, stable, and aesthetically pleasing smile once again. Call (210) 880-6852 to have your questions answered about getting all on 4 dentures.